The Parisian House unveils the first images of his imminent collaboration with the artist Pharrell Williams. The creative icon is seen sporting a number of branded apparel including a T-shirt and a quilted bucket hat, matching yellow loafers and a patched hoodie, and an oversized sling bag matched with a fuzzy bathrobe and green footwear. A closer look at the yellow bathrobe reveals “Chanel Pharrell” embroidery on the pocket, confirming that this piece will come in more than one color. Pharrell is also decked out in accessories ranging from necklaces to rings and statement bracelets. 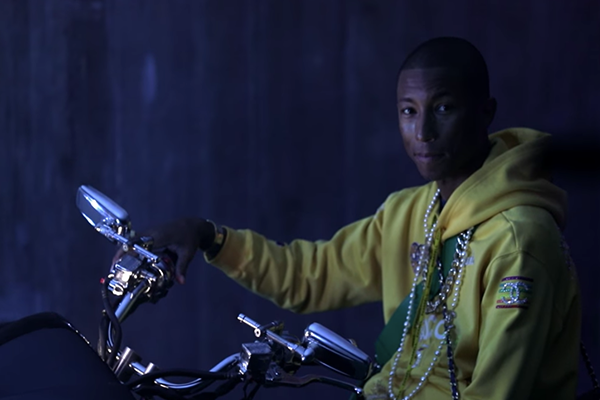 Performed in behind the scene mode, this sequence of just over four minutes is behind the scenes of the creation of the Pharrell x Chanel campaign. In a very sci-fi decor inspired by the Akira manga and featuring a gang of futuristic bikers, we discover pop pieces embellished with patches and embroidery. XXL jewels, sneakers hit with feminist slogans: Chanel is streetwear and genderfluid for this collection which has incited the designer to put all his energy into “the design, the colors and the unisex spirit”. As a note of intent, Pharrell Williams links the ability of Gabrielle Chanel, in his time, to break the codes and boldness of the House to create bridges between the creative world of fashion and music. The artist also returns on his fascination for the heritage of the label and the CC logo, its relationship to the number 5, and its bet – lost – at the origin of this capsule. A fine example of storytelling mixing incarnation, influence and brand consistency.